When Minecraft was first released and becoming popular, it was described by many as a “virtual LEGO set”. LEGO Worlds is now, ironically, being described as “LEGO Minecraft”. That’s a funny example of how the world works in cycles, but this title also has a lot in common with No Man’s Sky. How so? Both games are disappointing and filled with repeated content, and worse, LEGO Worlds is actually broken to a greater degree. As the game begins, the player is an astronaut who crashes their ship and must collect gold bricks to fix it. Once it can fly again, the loop is to travel from world to world, collecting even more gold bricks to further improve the ship and gain access to new tools and bigger planets. 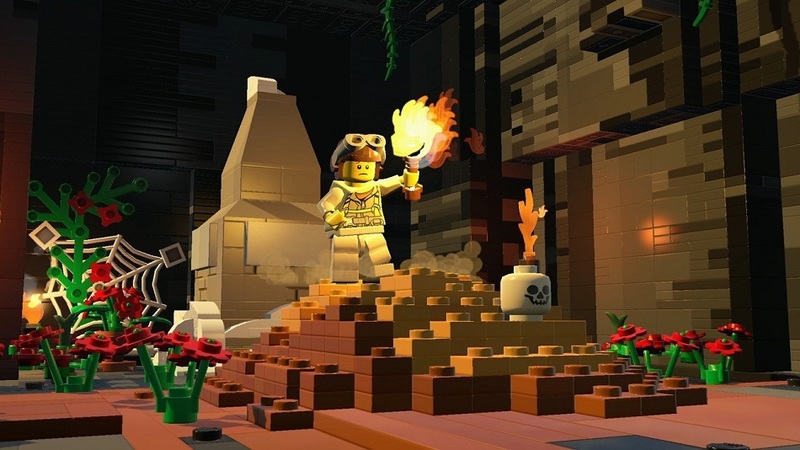 Considering that this is a LEGO game, fans might expect the focus to be on building things, but a lot of the tasks are about spawning or finding things. On the other hand, the quests that do ask players to build are some of the best in the game due to a powerful building tool. Players can place hundreds of different types of blocks and change their color, rotate, stack, copy and paste them, and more. The controls take a little time to get acquainted with, but once I did I was able to build things quickly, and they didn’t look awful! Unfortunately players don’t get immediate access to every brick in the game. Instead, players have to find them by chasing down “Troublemakers”. These are green trolls who randomly appear — tackle them and they’ll drop a new block, unlocking it in the menu. In my view, it’s terrible to lock one of the key features of LEGO behind a random event that will require players to grind for hours and hours. This isn’t a free-to-play title, so I can’t fathom why this aspect is so needlessly time-consuming. The developers should take a lesson from Minecraft’s creative mode that allows players to build anything they want. Unlocking bricks is a bummer but one of the coolest aspects of LEGO Worlds is that every planet is randomly generated, and in theory this sounds great. Sadly, it also ended up flopping hard for me. Apparently there are a ton of different biomes — deserts, forests, worlds made of candy, lava, etc. — but for whatever reason, I always seemed to find swamp worlds. Whatever the biome, each world is filled with quests to complete and treasure chests to open. That reward players with gold bricks, new items to build, new customization options and more. It sounds good on paper, but there are serious problems here. The first issue is that all rewards are random with no way to work towards specific items, so if a player wants to wear cool sunglasses or use a ninja sword, they’ve got to be prepared to grind. Or maybe they’ll be lucky and get them in the first five minutes? Either way, players will need to complete hundreds of quests and open hundreds of chests and many of these quests are repeats. I found the same “Build Us a Lab” quest at least five times. Other, smaller quests like “Bring Me a Hammer” pop up constantly. At one point I had three different quest-givers each giving the same quest. Another issue is that the most important rewards in the game are gold blocks, but I eventually just stopped getting them. Chests would hold everything but, and quests rewarded them rarely. Maybe the rate they were being dispensed at was bugged or maybe I was just really unlucky, but I got the sneaking feeling that the game was slowing my progress down by design. While the visual style of LEGO Worlds is great, the fantastic visuals are hard to enjoy due to inconsistent performance. The framerate buckles constantly, sometimes for only a few seconds, and sometimes entire areas of the world would be impossible to explore because the chugging would make it difficult to move around. The game is rough and unpolished in other ways, as well. Questgivers would often get stuck in the geometry of a world, walk away before I could interact with them, or fail to give me a reward when their quest was complete. I also had multiple hard crashes, and sometimes tools or other features would randomly stop working. Disclosures: This game is developed by Traveler’s Tales and published by Warner Bros Interactive Entertainment. It is currently available on PS4, Xbox One and PC. This copy of the game was obtained via publisher and reviewed on the PS4. 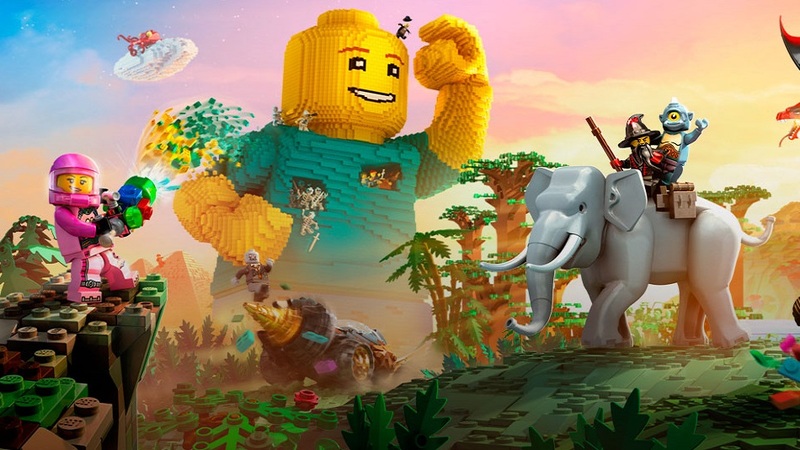 Approximately 16 hours of play were devoted to the game, and LEGO Worlds was not completed. Multiplayer is a separate mode and it also supports drop in-drop out split screen co-op. I played about two hours of online and splitscreen. Parents: According to the ESRB, this game is rated E10 for Everyone Ages 10 & Up. It contains cartoon violence. While players can “kill” enemies and creatures, they only break apart in comical fashion. There is no blood or gore. Players can find skeletons and zombies, but they are depicted as goofy and not disturbing. The game does have a wide array of weapons including pistols, shotguns, swords, lasers and bombs. Deaf & Hard of Hearing Gamers: Subtitles are provided to the player by default. Sound can be important in determining where some chests are, but the game does a good job of visually indicating items and quests on the minimap and in-game. It’s weird because Lego games have always maintained a consistent quality. At worse, they’ve been boring or repetitive. They’ve never been outright bad. This one . . . is not good.